Spring is here and so is your Energy Matters newsletter! In this issue, we help you understand window energy performance, update you on changes to your natural gas bill and show you some exciting projects, including examples from our 2019 Regeneration Forum speakers. UMP Users: Your Q4 2018 Reports Are Ready! Not on our mailing list for this publication? Sign up to get Energy Matters when it comes out. Windows are a big investment. But with so many types and technologies on the market, it can be difficult to figure out which ones to pick. So we have some tips to help you get started! A great first step is to make energy efficiency a top priority. In Canada, Energy Star windows have been tested and certified as the best energy performers on the market. According to Natural Resources Canada, Energy Star windows can save an average of 8% on your energy bills. Even better, models with the Energy Star “Most Efficient” designation are up to 40% more efficient than standard windows. So why replace a window with a standard model when you can also lower your ongoing energy use and improve the comfort of tenants? Take these steps below to choose the best windows for energy efficiency. U-Factor (U-Value): This is the rate of heat flow through a window. The lower the U-factor, the more energy efficient the window. U-factor can refer to the glass or glazing or the entire window unit. Make sure to ask what the overall unit’s U-factor is, because it’s the total performance that’s important. Solar Heat Gain Coefficient (SHGC): Is the amount of solar radiation admitted through a window and released as heat into the indoor space and is shown as a number between 0 and 1. A product with a high SHGC is more effective at collecting solar heat in winter, while one with a low SHGC is better at reducing the need for summer cooling. Consider the climate, orientation, and outdoor shading to determine the best SHGC rating for a particular location. Air Leakage Rating: The rate of air infiltration through a window under specific environmental conditions. A product with a low air leakage rating is more air tight. Installation also impacts air tightness, so hiring a good installer is crucial. Check out this Glossary for more helpful terms. Window types: Some windows, such as awning and casement, have lower air leakage rates. For a comparison of operating types, go to the bottom of this link. Frame types: Vinyl, wood, fiberglass, and some composites resist heat flow better than metal. See this pros and cons comparison of their relative performance and find out how spacers impact heat transfer. Glazing: This is the part of the window you see through, usually glass. An insulating glass unit typically has at least two panes of glass separated by a spacer bar, is filled with an inert gas like argon or krypton to reduce heat transfer, and is sealed around the edges to make them airtight. The more glazing layers, the better. 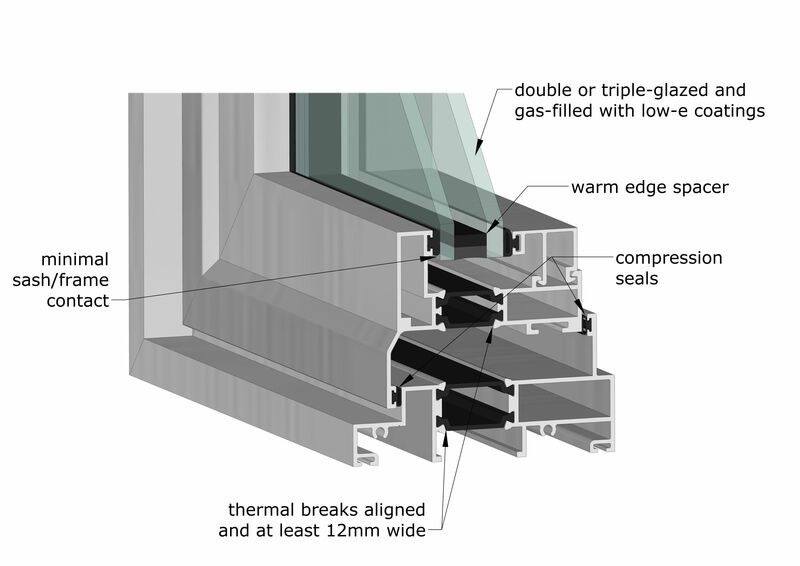 Here is a useful comparison of double and triple glazed performance. Low-Emissivity (Low-e) Coatings: These ultra-thin films improve a window’s insulating properties and help control solar heat gain. Low-e coated windows may cost 10-15% more than standard windows but can reduce energy loss by up to 30-50%. These coatings can reduce a window’s ability to transmit visible light, so consider a spectrally selective low-e coating. Learn more here. Inert Gases Between Panes: This will minimize heat transfer between the inside and outside of the window. Krypton is usually used when the space between panes is ~1/4 inch and while more costly it has better thermal performance. Argon can be used where spacing is larger, e.g. ~1/2 inch. See this detailed breakdown. Each window unit should be labelled with its performance ratings. See these Energy Star examples. Attachments: Awnings, operable shutters, and screens help reduce energy use by providing shade while still allowing light in. Learn about passive solar design here. Ask for models certified for your climate zone or for zone(s) colder than your region to save even more energy. Energy Star models made after January 1, 2020 will have the same climate criteria for all of Canada and will no longer be divided into three zones (1, 2, and 3). Older buildings or ones in in cold climates may need windows with medium SHGC values to let the sun’s heat in during winter months. Those in windy areas may benefit from models with compression seals to reduce air leakage, such as casement and awning units. For eastern and northern walls, windows with higher insulation values can help reduce heat loss. Installation impacts performance! Poorly installed windows may cause condensation, cold drafts, or even allow water leaks. Get at least 3 quotes and ask the installer to help you apply for incentives. Energy efficiency was the focus of two inspiring sessions at HSC’s recent Regeneration Forum. Presenters looked at both retrofits and new developments and shared a range of examples to inspire and inform providers of all sizes. In this session, speakers shared their decision making processes, methods, and lessons learned as they built new housing developments and deep retrofits to the Passive House standard. Are Energy Focused Design and Affordability Compatible? This session focused on the question of whether you need to choose between cost and efficiency. Speakers shared practical examples of energy-focused design for new builds and energy retrofits. Starting on April 1, 2019, natural gas customers, including those in HSC’s program, will see a carbon charge of $0.0391 per cubic meter on their monthly bills. The carbon charge applies to fossil fuels sold in Ontario. It is part of the Federal government’s carbon pricing program, which is for Provinces and Territories without emissions pricing plans. The charge will increase by 2 cents annually each April and will appear as a separate line item on bills. The Federal government has stated that fuel-charge proceeds will be reserved for targeted funding programs and investments to reduce emissions for various sectors, including municipalities and non-profits. Further details are expected to be outlined in 2019. HSC has reached out to the Federal government to discuss investment opportunities for our sector. In the meantime, housing providers should budget for the increase in natural gas costs until further details are released. For more information, visit the Government of Canada’s Ontario and Pollution Pricing web page. This webinar will introduce you to the new UMP system, including dashboards and basic reports. If you missed our previous introductory webinars or are new to UMP, this webinar is for you. The time slots are tailored by organization type, so please click the appropriate time slot to register. This webinar builds on what you learned in the introduction to give you a deeper understanding of your data. We will look at specific examples, learn to spot issues and anomalies, and discuss how to use the data to report to your boards. This webinar is for all user skill levels and will focus on the Dashboards and Reports modules. This webinar will provide an introduction to this tool, including how to use it, review results and produce reports. This webinar is for any user skill level; familiarity with energy concepts is helpful but not required. We plan to add more webinar topics over time and want to know what you’d like to see. If you’d like to suggest a topic or want a one-on-one review with HSC staff, please contact energyservices@hscorp.ca. • Regulatory amendments that hold increases to residential electricity bills to the rate of inflation, starting May 1, 2019. The Province also introduced legislation that would, if passed, replace the Fair Hydro Plan with a new on-bill rebate, effective November 1, 2019. • Directives to refocus and centralize the delivery of energy efficiency programs for electricity customers and to cancel certain programs. Under these directives, the Independent Electricity System Operator (IESO) is now centrally delivering energy-efficiency programs on a province-wide basis. The programs will now focus primarily on business and industrial programs until December 31, 2020. • Energy-efficiency programming for Indigenous communities. • Heating and Cooling Incentive. All programs delivered by local distribution companies will be discontinued. Existing applications that have a binding agreement will be honoured and processed through the local utility that approved the application. Questions about applications that have been submitted but are not yet approved should be directed to the local utility offering the program. For further details on the refocused and discontinued conservation programs, visit saveonenergy.ca. If the legislation is passed, the average residential customer would see increases to their electricity bills held to the rate of inflation, starting May 1. Also, the full electricity cost including Global Adjustment would be shown on the electricity line of the bill starting November 1. A new replacement for the reductions provided through the refinancing of the Global Adjustment and the current 8 per cent Ontario Rebate for Electricity Consumers would appear on bills as a single line-item rebate. Learn more about the potential rate changes on the Government of Ontario website. Your Q4 2018 Reports Are Ready! Year-over-year Use Comparison: one report each for gas, electricity, and water, comparing your use over multiple years. Annual Utility Use Summary: a 12-month summary of your energy use and utility costs in pie-charts and data tables. Log-in to UMP and go to “Reports–Reports Shared With Me” to download all four reports to PDF. Not sure how to download your reports? Follow these step-by-step instructions or contact energyservices@hscorp.ca. Don’t forget to sign up for an upcoming training webinar, there are new topics, as well as introductory training already scheduled.